What does ‘TAV Cycles’ mean? Well, back in October 1989, Steve Joshua and his son, Jason, opened a shop called AutoVogue in Ryde High Street. As can be seen from the name, we sold motor parts, but also a handful of cycle accessories. By 1993 the shop had more than doubled in size and cycles were more evident than car motor parts. Brands such as Muddy Fox, Claud Butler and Specialized helped to establish AutoVogue as a serious cycle shop. In the mid 90’s we had success with the trials scene and several lads rode in a team for us, taking part in competitions and displays. As a result, we became known as Team AutoVogue. 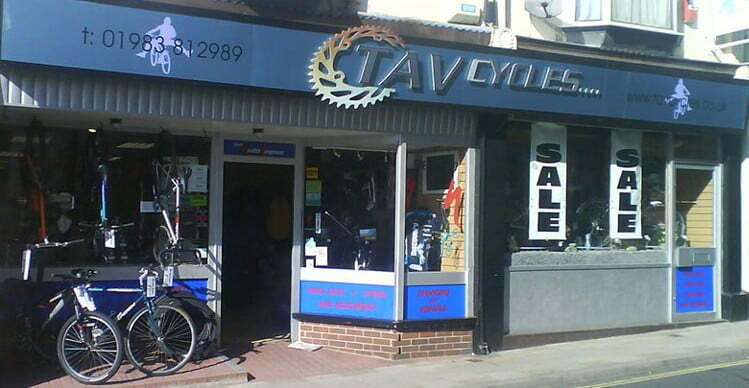 By now you have probably worked out that the change to our current name TAV Cycles, an abbreviation of Team AutoVogue. We now sell mainly cycles and are Island agents for Specialized, Mongoose, Trek, Pashley, Claud Butler and many more. But so as not to forget our humble beginnings, we have a small area in our shop dedicated to car care products! Our aim is to provide a friendly, professional service in a relaxed family atmosphere, we are keenly interested in ‘getting it right’ for our customers and that includes our bike, shoe or helmet fitting services and our workshop facilities. Contact us with any questions or concerns and we promise to do our best to help.